Have you ever found a bottle of wine that, seemingly like fate, ended up on your rack after such an odd and absurd chain of events that it was almost meant to be? The 2007 Del Rio Vineyards Claret recently filled that niche for me, for had the day I purchased the wine gone a different path at a number of junctures, it would have meant no wine for me. At the end of August, Micheal and I took a much needed vacation to Bend and Crater Lake. When it comes to travel, I'm a planner. I'll have reservations, maps, agendas, bottles of wine, and tickets finalized months prior to the trip. This trip was exactly opposite of that philosophy. The epitome of spontaneity, I hadn't had the time to think about this particular vacation until about 2 weeks prior. The result? Lodging reservations about 45 miles from the lake at the Historic Prospect Hotel, and tickets for the Crater Lake Boat Tour on a day that had a marginal weather forecast. We arrived at Crater Lake on a gorgeously sunny Friday afternoon. Crater Lake is the deepest lake in the United States, and has a transfixing deep blue color even on the worst of days. On a sunny day, the lake literally sparkles. After driving around the 33-mile Rim Drive (he he, Rim Drive), we headed into Prospect to eat at the Dinnerhouse at the Historic Prospect Hotel where we were staying. After an awesome prime rib paired with some wine from Crater Lake Cellars, Micheal and I reviewed our plans for the next day. Drive to the lake...hike a quick little jaunt down to the boat launch at Cleetwood Cove...and head out for a 2-hour spin around the lake with park rangers. Awesome. The revised weather report indicated a high probably of rain and a moderate temperature. Not so awesome. It was Oregon though, so a little rain wasn't going to stop us. We hit the road to the lake on Saturday, the day in question, and the drizzle started. It was about 50-degrees and a little foggy, but no big deal. As we started gaining elevation, the temparature started dropping. And dropping. And dropping. 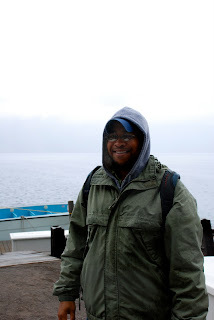 By the time we ascended about 2000 feet to the parking lot for the boat tour, it was 30 degrees. And snowing. That's right, snowing. In August, in Oregon. And we were scheduled to go on an open-top boat in the middle of the deepest lake in the nation. Brrr. The ticket attendant looked at our light jackets and noticeable lack of gloves or hats, and intelligently talked us into a refund. We decided to still do the hike down to the boat launch, the only place at Crater Lake where you can access the water. The little jaunt wasn't so little. Despite only a mile in distance, the hike dropped almost 1000 feet in elevation over that mile. It was steep, and cold. We did the loop and my seat warmers never felt so good. But, as it was only about Noon and still snowing and cold, we needed to find a way to occupy the rest of the day. What to do...what to do. I thought back to dinner the night before, and it hit me. Crater Lake Winery! The drive was about an hour, how could we not go? We started heading towards the winery and decided to stop for lunch. Two restaurants and 3.5 hours later (yep, they that busy), we hit the small town of Shady Grove, Oregon and found the winery. As we walked towards the door, I saw an ominous sign on the door. That equals 100%, right? We swirled, sniffed, and sipped, and found some awesome flavors of currant and fig. The mouthfeel of this wine was lighter than I would have guessed based on the composition, but in a totally awesome way. The more we drank the more we liked, and this Claret is proof that Southern Oregon can stand up to Eastern Washington in the battle of the big reds. Next thing we knew, the bottle was empty and the Del Rio episode was done. For now. Luckily, I have another bottle on the rack for the next time I want to have an absurd and random experience. Oh, and next time you want that awesome bottle at an awesome price, check out the grocery store in Shady Grove. Don't worry about the name, it's the only one. Cheers!